Early last month, a few of Florida Agency Network’s executive team checked out this year’s National Settlement Services Summit (NS3) in Detroit, MI. NS3 is one of the title and settlement industry’s largest conference. Bringing the industry together to celebrate innovation, recognize accomplishments, and discuss the future of the industry. Here are a few pictures from the conference. 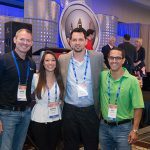 The post Florida Agency Network at NS3 appeared first on Florida Agency Network.